Looks yummy. 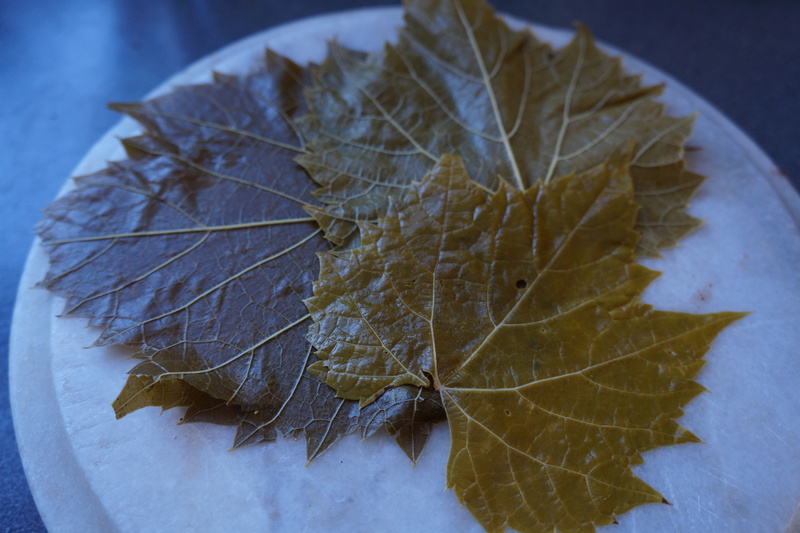 Any good links on how to prepare grape leaves to a state they can be used to cook? Do you have to get them when they’re young? Any special type of grape vine? Thanks for visiting my blog. I should have included a link to my original post when I collected the leaves. If they are fresh, they just need to be blanched, then I use them or freeze them in stacks. If using ones from a jar, they need to be rinsed until most of the salt is cleaned off them. I usually pick them quite young, but big enough to be ‘fillable’. I did pick later in the season, with great care not to get ones that were tough. It seems the vines do put out a few new leaves throughout the season. Thanks, Hilda. I do some foraging – just ran out of frozen milkweed – and I always wondered about grape leaves. Have to give them a go this year. Thanks for dropping by. 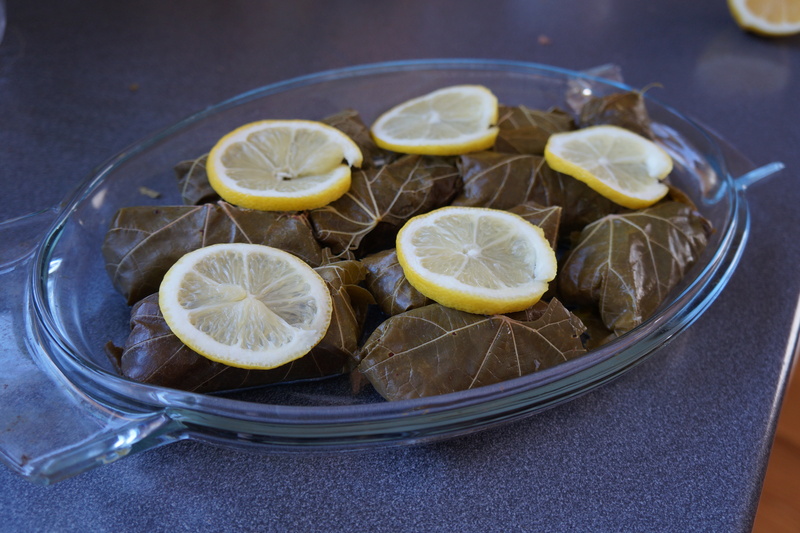 Grape leaves are really one of the easiest things to forage – it is just a question of having some ideas of what to do with them, I think. Lovely idea for this fish which I know as Walleye Pike from the summers I spent in Bemidji Minnesota. We would eat it fried with cornmeal, but I love this preparation! Thanks for commenting. I noticed that walleye is really a thing in Minnesota. It is pretty new for me since I moved to the country. I hope you get a chance to try it. Hilda, this sounds really good, even though it’s fish, lol… No, seriously, grape leaves and za’atar, I’m sold. The plate with the bundles nestled against the saffron rice looks very appetizing to me! I need to google what pickerel is. Tilapia is on sale at the grocery. I wonder if I could use that, instead. This looks so delicious… your photos are so beautiful.. I would really love to give this a try! I’m going to have to ask around here where I can find grape leaves. I’ve never cooked with them, so I’ve never really looked for them! I’m wondering if I’d find them in the produce section.. Lovely post! Thanks. I haven’t bought grape leaves in a while, but I would think particularly in shops which specialize in any Mediterranean food would carry them. And in the spring, you can start looking for wild vines growing in ‘clean’ areas. Thanks for the comments. I would think tilapia would work well. It has a similar texture and mild flavour too. This looks so delicious especially with the use of za’atar spice. 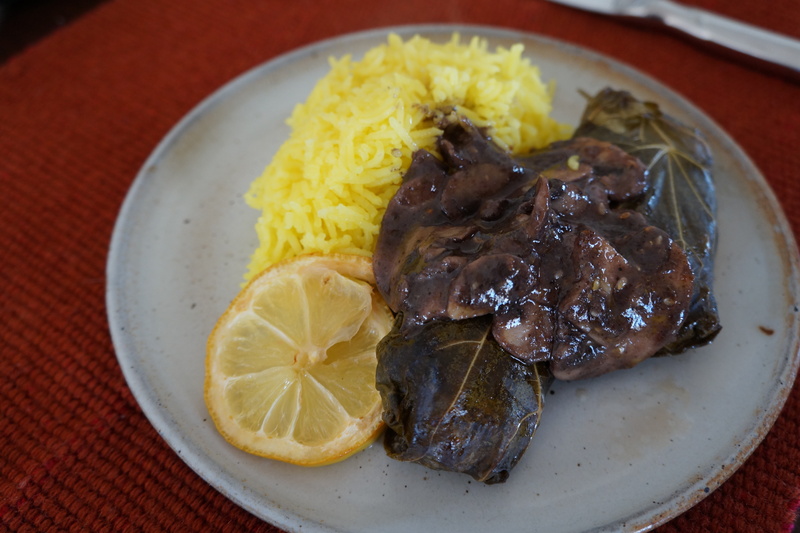 I have never cooked with grape leaves but your recipe is tempting me to try it! Both the filling and the sauce sound amazingly spicy and delish! Thanks. I think the sauce might even be worth making for other dishes e.g. polenta. Thanks for dropping by. I really wanted to wrap whole fish and bar-b-q it but couldn’t find decent, wild whole fish and there was too much snow outside, but I hope I can do that recipe some day. By the way, I am just now baking some of those delicious cookies on your recent blog. Thanks again for all those great recipes.